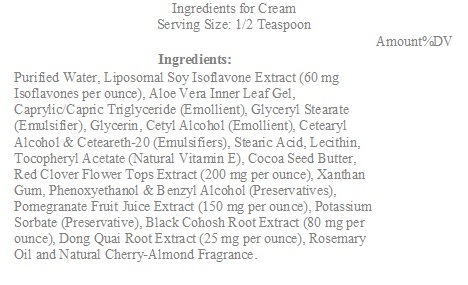 Suggested Use: Massage 1/2 teaspoon of cream twice daily into smooth skin areas such as wrists, face, throat or chest. For topical use only. Do not use on mucous membranes. Individual needs may vary. This cream may be used throughout the month. Warning: Do not use if you are pregnant, may become pregnant, or breastfeeding. Consult physician before using if you are using blood thinners, anticipate surgery or are taking multiple medications.